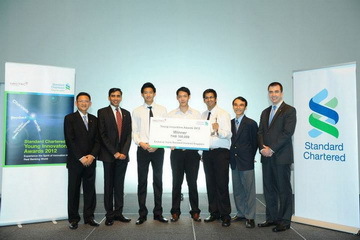 On September 17th 2012, two teams from BBA Thammasat represented our program at the final round of the Standard Chartered Young Innovators Awards 2012. These two teams of fourth year students were Team Mozarella, which consisted of Saran Sriweraskul (Aom), Thawatchai Vikiniyatinee (Aek) and Kraisri Kuludomphongse and Team Init, which consisted of Varisara Tantrativud (Tong), Thanyaporn Thanormklin (Nac), and Tananya Kruabua (New). In this competition, students were required to come up with any new banking innovations that they thought would help improve Standard Chartered Bank Thailand in any of the following categories: product innovation, service innovation, channel innovation, and green technology. Over 60 teams submitted their ideas and 7 teams were chosen to pitch them to esteemed judges from Standard Chartered, AIS, and NECTEC in a 15- minute presentation which was followed by 10 minutes of Q&A. 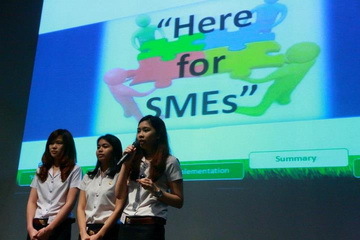 In addition, team Init also received the merit award after giving a great presentation for idea to help SMEs in Thailand. This idea involved creating an application that increase business between SME customers of Standard Chartered by acting as a match-maker application that would enable SMEs to find and identify potential business-partners across their value chain. This would then help increase business and financial transactions for the bank itself. For our success, we would like to thank the BBA program and the ajarns for providing us with valuable information that helped guide us along the way. In addition we would like to thank Standard Chartered for sponsoring and holding this event which allowed us to apply the skills we learn in the class-room. We are very proud that we have brought home a prize for BBA Thammasat on the first edition of this competition, and are sure that there will be more to follow. Posted date: September 20, 2012 � 16:00 hrs.